Apple plans to reduce the number of new hires for certain divisions after the company missed revenue guidance for the December quarter on weak iPhone sales, according to a report issued on Wednesday. 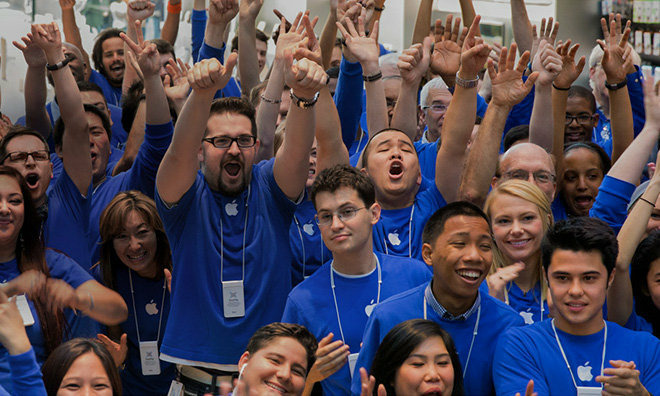 Apple store employees gather for a photo. Citing people familiar with the matter, Bloomberg reports CEO Tim Cook disclosed the news to employees in an all-hands meeting earlier in January, when he was asked whether slumping iPhone sales would prompt a hiring freeze. In his response, Cook said a complete shutdown of hires is not a viable solution, adding that Apple's health is not measured by hiring rates, the report said. The hiring reductions are not company-wide, with cutbacks to be spread across multiple divisions. Cook has yet to determine which segments will be impacted by the hiring policy, though he confirmed key teams like Apple's artificial intelligence group would continue to aggressively recruit new workers. The change does not affect plans for the company's new campus in Austin, Tex., or a buildout of its video team in Los Angeles, the report said. In separate meetings with group managers, some senior vice presidents said the iPhone sales slowdown represents an opportunity for new innovation, the report said. The all-hands meeting was held after Cook announced a surprise revenue guidance revision for Apple's important December quarter. In a note to investors, the chief executive said the company is anticipating $84 billion in revenue for the three month period, down from a forecast of between $89 billion and $93 billion stated in a quarterly earnings report last November. The drop in revenue was blamed in large part on a slowdown in iPhone sales, particularly in China and other emerging markets. Cook in his letter also noted Apple saw fewer upgrades than expected over 2018, a phenomenon that could be due to an uptick in battery replacements. According to a report on Monday, Cook, at the same all-hands meeting in January, revealed Apple replaced some 11 million iPhone batteries under a special repair program that slashed the price of said service from $79 to $29. The 11 million unit figure eclipses the 1 to 2 million replacements Apple expected under normal circumstances. Beyond the decrease in new hires, Apple has responded to the iPhone sales by slashing iPhone production by 10 percent for the first calendar quarter of 2019. In a bid to goose sales, the company last year launched a promotional upgrade program that offers cheaper prices on its latest iPhone XS and XR lineups. Last week, the company cut iPhone XR prices for Chinese resellers in a bid to stoke demand in the country.